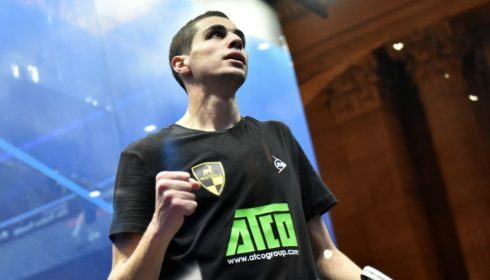 Egypt’s Karim Abdel Gawad will start the new year inside the top five on the PSA Men’s World Rankings after his title-winning run at the inaugural CIB Black Ball Squash Open in Cairo last month. 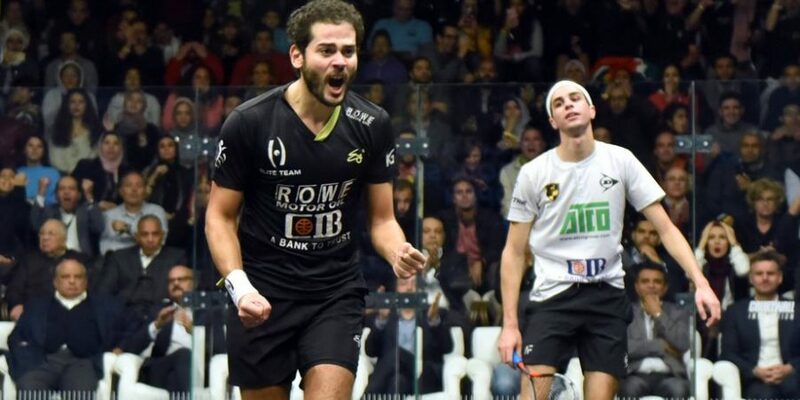 Alexandria-born Gawad, a former World No.1, defeated World No.2 Ali Farag in the final to capture his first PSA World Tour Platinum tournament since January 2017 and is rewarded with a four-place rise to World No.5 in the January rankings. Fellow Egyptian Mohamed ElShorbagy stays at No.1 for a 10th successive month after Farag squandered the chance to take top spot at the Black Ball Open. 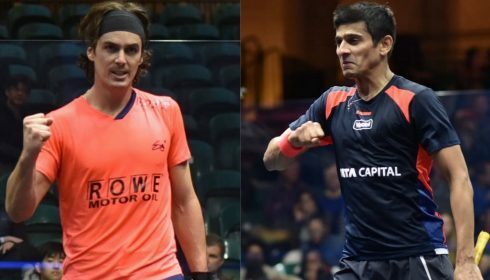 The battle for World No.1 will reignite at the Tournament of Champions later this month – if Farag wins the tournament and ElShorbagy bows out at the semi-final stage or earlier, then the former will claim top spot. 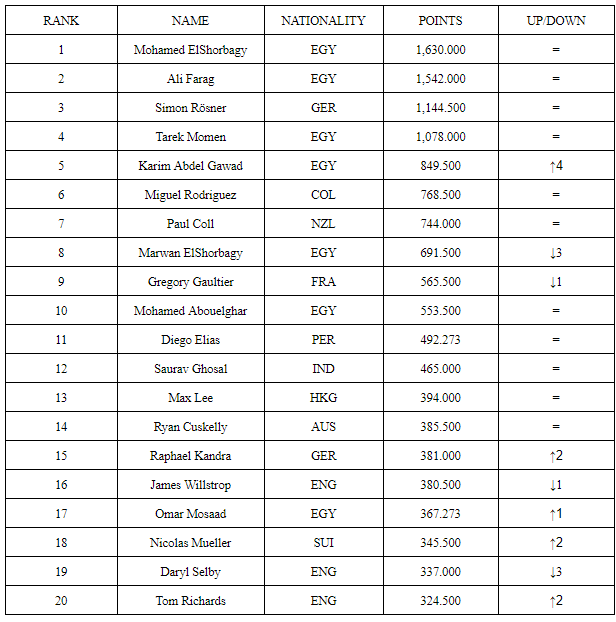 Germany’s Simon Rösner is the highest-ranked non-Egyptian at No.3, while Tarek Momen is the other player featured in the top five. Colombia’s Miguel Rodriguez and New Zealand’s Paul Coll stay at No.6 and No.7, respectively, while Marwan ElShorbagy drops three places to No.8. 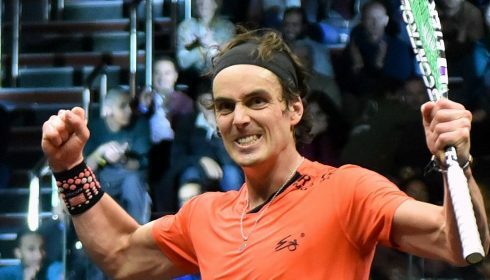 Frenchman Gregory Gaultier – who is currently out of action due to a knee injury – drops to No.9, with Mohamed Abouelghar completing the top 10. Peru’s Diego Elias stays at No.11, while India’s Saurav Ghosal (No.12), Hong Kong’s Max Lee (No.13) and Australia’s Ryan Cuskelly (No.14) all retain their places. Germany’s Raphael Kandra has moved up two places to a career-high No.15 ranking. England’s James Willstrop drops a place to No.16, with Egypt’s Omar Mosaad moving up to No.17. Switzerland’s Nicolas Mueller rises two places to No.18, while England’s Daryl Selby falls three spots to No.19. The final place in the top 20 is taken up by Englishman Tom Richards, who returns to the top 20 for the first time since August 2013. 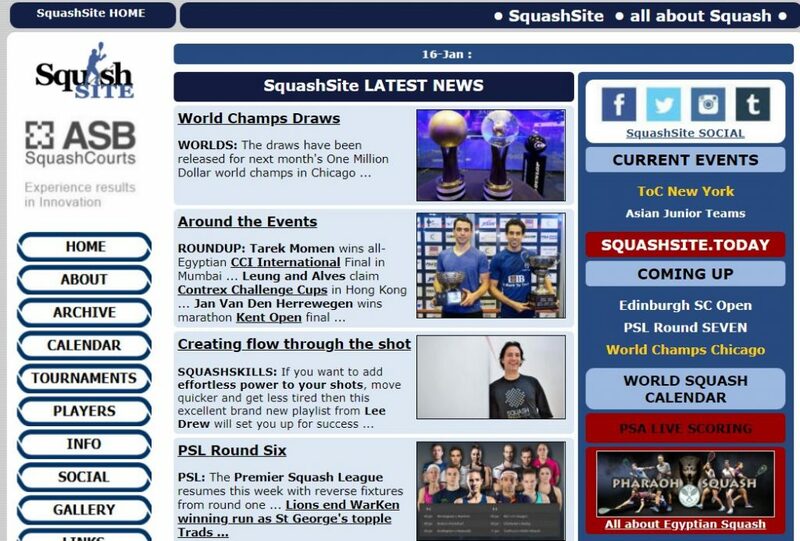 England’s Laura Massaro and America’s Amanda Sobhy have moved up to World No.7 and World No.11, respectively, in the PSA Women’s World Rankings for January. 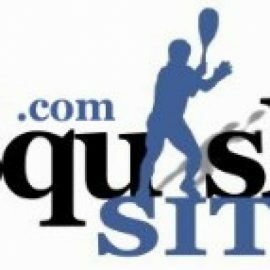 Massaro defeated Wales’ Tesni Evans to win the Monte-Carlo Squash Classic, PSA Challenger Tour event last month to lift her first PSA title since the British Open in May 2017.Meanwhile, Sobhy has risen two places to No.11 – her highest ranking since October 2017 – and the Boston-based Harvard-graduate will look to break back into the top 10 when she competes on home soil later this month at the Tournament of Champions in New York. 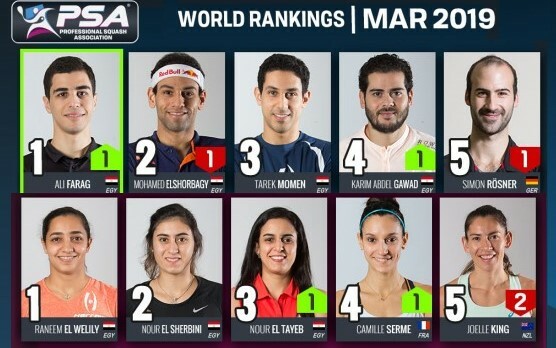 Egypt’s Raneem El Welily will begin the new year at World No.1 (on her birthday) ahead of previous incumbent Nour El Sherbini, while Nour El Tayeb stays at No.3. 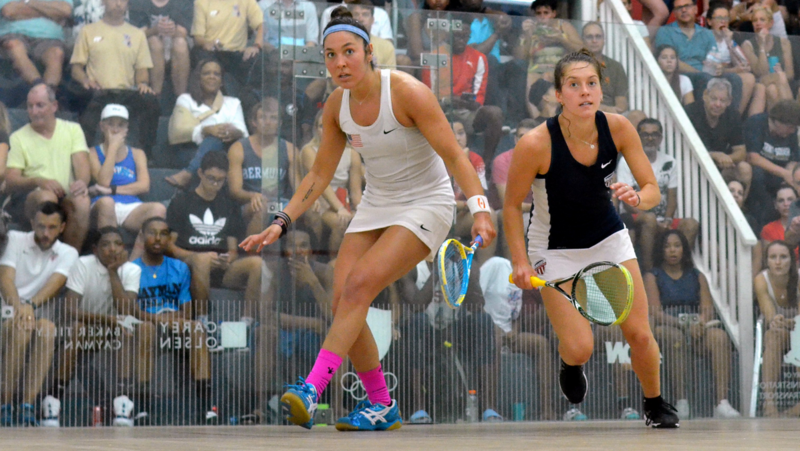 New Zealand’s Joelle King and Camille Serme take the other two spots in the top five. Sarah-Jane Perry stays at No.6 ahead of compatriot Massaro, while Egypt’s Nouran Gohar drops to No.8. England’s Alison Waters rises a place to No.9, switching places with Evans, who rounds out the top 10. 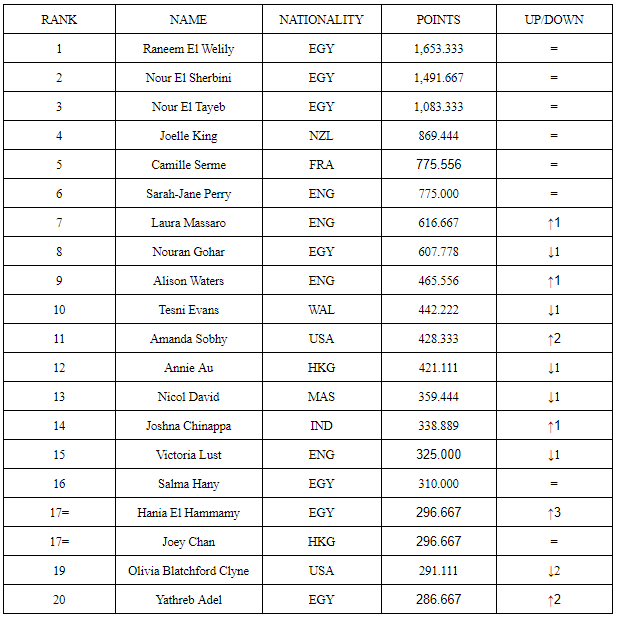 Sobhy’s rise up the rankings means Hong Kong’s Annie Au and Malaysia’s Nicol David fall to No.12 and No.13, respectively.